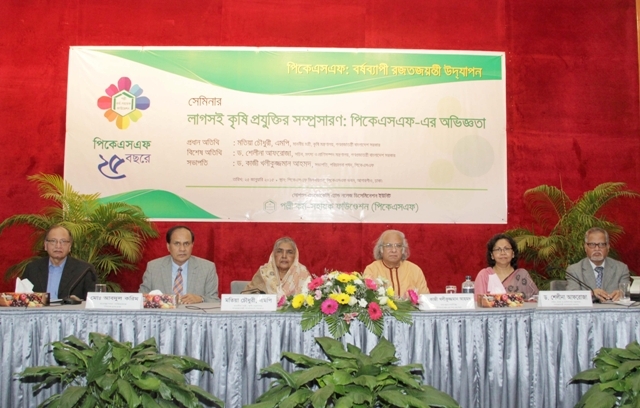 Palli Karma-Sahayak Foundation (PKSF) organized a seminar on “Extension of Appropriate Agricultural Technologies: Experience of PKSF” at PKSF Auditorium, Agargaon, Dhaka on 25 January 2015 as a part of the year-round celebration of its Silver Jubilee program. The seminar became a platform to disseminate knowledge and share its experience on the extension of appropriate agricultural technologies which are useful in increasing agricultural productivity. Matia Chowdhury MP,Hon’ble Minister, Ministry of Agriculture graced the occasion as the Chief Guest. She said, there is a need to develop a strong relationship between Government and Non-Government organizations to enhance agricultural production through inventing high yielding varieties of crops as well as introducing appropriate technologies. She urged the NGOs to supplement the government efforts to develop the agricultural sector as the country’s 16 percent GDP comes from agriculture. Dr. Shelina Afroza, Secretary, Ministry of Fisheries and Livestock was the Special Guest of the programme. She said, modernization of agriculture is needed for the economic development of the country.Dr. Mustafa K. Mujeri, Director General, BIDS, the distinguished Speaker said emphasis must be given on agriculture sector as it has been playing an important role in the country’s macro development. He also said, science-based technology will be the key to future in the agriculture sector. Dr. Zahurul Karim, former Secretary, the distinguished Speaker urged the Government to scrutinize the new technologies before introducing them to the agricultural sector to avoid negative impacts of technologies, if any, in the future. The seminar was chaired by Dr. Qazi Kholiquzzaman Ahmad,Chairman, PKSF. Mr. Md. Abdul Karim,Managing Director, PKSFdelivered the welcome speech. Mr. Golam Touhid, Deputy Managing Director (Opertaions), PKSF was the keynote presenter in the seminar. Agriculture scientists, representatives of different Partner Organizations and famers were present at the seminar.